Thai Herbal Poultice Massage Tuesdays ALL SUMMER LONG!!! Have you experienced a Thai Massage before? If not, you’re in for a treat! This gentle massage style incorporates light movement, stretching and massage therapy to create a truly unique experience. 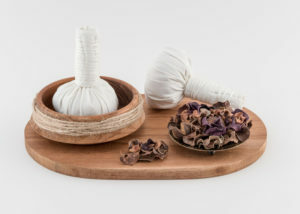 Normally a $10 enhancement, the addition of steamed herbal poultices will enhance your massage, leaving you feeling relaxed, open and ready to move through your day. Ready to experience bliss? Book a Thai Massage any Tuesday with Kathryn, Julie, Heather, or Levi now through August 30, 2018 and you will receive FREE Thai herbal poultices enhancement with your session. BOOK NOW!